Beyoncé and I have a lot in common. Stay with me here. I live in Houston, she's from Houston. She just announced she is pregnant with twins, I have twins. We had an older daughter before having our twins, and so does she. She likes to visit BB's Café when she's in town and we love that place, too. If we met in real life, I hope we would hit it off. It also doesn't hurt that "All the Single Ladies" is one of our bedtime songs. True story. So, since we are (clearly) already meant to be friends, I feel like I can give Beyoncé a little direct advice about twin parenthood. Things that applied to raising Blue Ivy don't necessarily apply when you have twins. "Never wake a sleeping baby," doesn't work when you need two kids on the same feeding schedule to have any chance of taking a shower or sleeping again. How do you feed two babies at once? What kind of stroller works best for two infants and an older child? Should they sleep together or apart? How do you survive bed rest? These were the kinds of questions I never asked with our oldest, but faced during my twin pregnancy. Find some other twin moms and ask them all your questions. I know it doesn't sound like it would be that different than having one, but it is. Reach out to Julia Roberts and Sarah Jessica Parker. They will give you the real scoop. I know you are in amazing shape, and judging from the photo you posted, you are already carrying your babies like a dream, but twin pregnancies are hard on every body! I remember being at an OB appointment and asking if it was normal to be this darn tired. My OB laughed and said, it is with twins! Double the bodies, hormones and exhaustion. Add that to chasing around a pre-schooler and man, it isn't easy! Many twin moms also end up on bed rest, so be sure to take care of yourself. I know you are used to doing it all and you are great at it, but slow down if you need to. No shame in that. This seems like a no brainer, like, of course they are two different people. There are twice the amount of diapers to change! When we had our twins, a fellow twin veteran who actually has two sets of twins (so you know she's an EXPERT) told me to remember that twins are two different kids who happen to share the same birthday. You do your best not to compare them, but it is hard when they are the exact same age. You will want them to have similar sleep patters, hit milestones at the same time or enjoy the same activities because life is simpler when they sync up. Sadly, that doesn't always happen. Our twins had to be on different kinds of formula due to different reflux. One napped, one didn't. One walked three months before the other one. The list goes on and on. As soon as I learned to just accept that they are doing things in their own way and in their own time, the easier it was to let some of my expectations go. Our daughter was three when our twins were born. Twin baby newborns get a lot of attention. We were stopped everywhere for people to dote on them. Sometimes, people looked past our oldest as if she wasn't even there. That took a toll on her and she started to act out a bit for attention. Just remember this is normal. Even though you will be exhausted, do your best to carve out a few moments of each day for just Blue Ivy. It will make a world of difference for her to know that she is special too. We also made our older daughter a huge part of the excitement of having twins. She announced everywhere that she was the big sister to twins. Then she got to tell the story of how big they were, how early they were, etc. That helped her to own it and be included in all of the fuss. When people learn that I am the mom to twins, the reaction is mixed. Sometimes I get "Wow" or "You've got your hands full" or even "I would never want twins." Don't let anyone steal your joy. Having twins is awesome. Sure, it is hard, and when they are toddlers and destroying the house and running in two different directions it can be down right frustrating. But the bond they have is powerful. They have been each other's best friend and champion since birth. They invent games and can play together for hours. I have videos of them playing peak-a-boo and cracking each other up at nine months old. It is magic to watch them interact and love each other sometimes. I wouldn't trade it for the world. I can't wait for you to see. This piece was originally published by Amanda Sorena on Mommy Nearest. 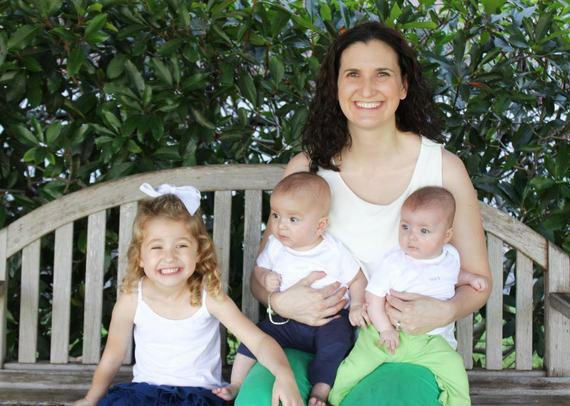 Amanda Sorena is a freelancer writer and Public Relations Specialist who lives in Houston, Texas with her husband and three children.